Do you feel that peanut butter and chocolate is one of the best flavor combinations in existence? And that's why we adore these Double Chocolate Peanut Butter Thumbprint Cookies. They get a double dose of chocolate by using both baking cocoa and semi-sweet chocolate chips and the thumbprints are filled with your favorite peanut butter, either chunky or creamy. If you've never made thumbprints, they're really not that difficult and the upside is that they look really nice. Once the cookie dough is mixed, and chilled to firm up a bit, you simply roll the dough into balls and then make a little indent by pressing into the dough ball with your thumb. Then, you simply fill the indentation with filling, in the case of this recipe it's peanut butter, and bake. Just like that you've created awesome homemade thumbprint cookies. In a small, heavy saucepan over lowest possible heat, melt 1 cup chocolate chips, stirring constantly until smooth. In a large mixing bowl, beat granulated sugar, 1/3 cup peanut butter, butter and vanilla until creamy. Beat melted chocolate into peanut butter mixture. Add eggs, one at a time, to chocolate mixture beating well after each addition. Grandaully beat in flour mixture until combined. Stir in remaining 1 cup chocolate chips. Cover cookie dough and refrigerate until firm. When you are ready to bake, preheat oven to 350F degrees. Shape portions of dough into 1 1/2-inch balls by rolling between palms of hands. Place dough balls on ungreased baking sheets at least 2 inches apart. 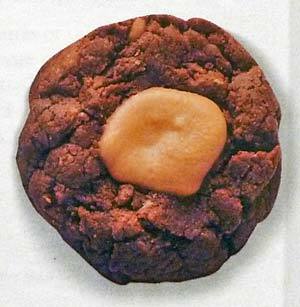 Press your thumb or index finger into the center of each cookie to make an indentation that is about 1/2-inch deep. The back of a round 1/4-teaspoon measuring spoon can be used to make the indentation if you prefer. Fill each indentation with about 1/2 teaspoon peanut butter. Bake, one cookie sheet at a time, in the center of the oven about 10 to 15 minutes, or until sides are set but centers are still slightly soft. Remove from the oven and let cookies stand on the sheet 2 minutes before transferring to wire racks to cool completely. This recipe makes about 3 1/2 dozen Double Chocolate Peanut Butter Thumbprint Cookies.